The analysis of singular perturbed di?erential equations began early in the twentieth century, when approximate solutions were constructed from asy- totic expansions. (Preliminary attempts appear in the nineteenth century - see[vD94]. )Thistechniquehas?ourishedsincethemid-1960sanditsprincipal ideas and methods are described in several textbooks; nevertheless, asy- totic expansions may be impossible to construct or may fail to simplify the given problem and then numerical approximations are often the only option. 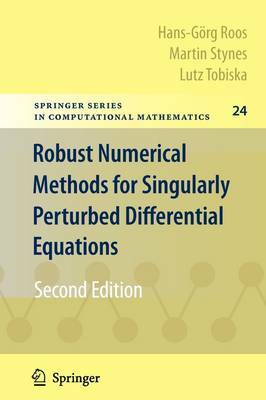 Thesystematicstudyofnumericalmethodsforsingularperturbationpr- lems started somewhat later - in the 1970s. From this time onwards the - search frontier has steadily expanded, but the exposition of new developments in the analysis of these numerical methods has not received its due attention. The ?rst textbook that concentrated on this analysis was [DMS80], which collected various results for ordinary di?erential equations. But after 1980 no further textbook appeared until 1996, when three books were published: Miller et al. [MOS96], which specializes in upwind ?nite di?erence methods on Shishkin meshes, Morton's book [Mor96], which is a general introduction to numerical methods for convection-di? usion problems with an emphasis on the cell-vertex ?nite volume method, and [RST96], the ?rst edition of the present book. Nevertheless many methods and techniques that are important today, especially for partial di?erential equations, were developed after 1996.